Avid followers of Biologi may have seen that formulation chemist and Biologi founder, Ross Macdougald, is now on Instagram. Ross recently set up a profile, not to jump on the social media bandwagon, but with a primary goal to bust some of the common myths that circulate the skincare industry. The misinformation that surrounds the industry about some of the most common ingredients used in everyday skincare products continues to astound him. With 25 years’ experience formulating skincare for some of the most well-known brands in the world, Ross identified that natural extracts were manipulated in a way that can cause harm to the skin, and consumers were being sold on marketing taglines to make them think they’re buying natural products. A world first, Ross designed and developed revolutionary technology that extracts plant serum in its natural liquid matrix, so it mimics its efficiency on the skin, just as it does in the plant. The pioneering technology led to the creation of Biologi, a range of single plant ingredient serums rich in 100% active phytonutrients. Biologi is free from diluting water, irritating fragrance, occlusive emulsifiers and synthetic activating agents. The synergy of the natural nutrients found in each serum not only gets results, but is kind to your skin in the process. One of the most common myths that circulates the industry is the use of vitamin C in skincare. Notoriously unstable as soon as it comes into contact with the air, Biologi is the first skincare brand in the world to extract stable, active vitamin C without the use of synthetic stabilisers and activating agents that are harmful to skin and health. Ross talked to us about how the use of synthetic vitamin C (such as ascorbic acid) is NOT the same as natural vitamin C (straight from the fruit), and consumers are being fooled into thinking it is. If your product has any of these ingredients claiming to be vitamin C, here’s the truth from Ross about what you’re actually putting on your skin and therefore exposing your system to. Why vitamin C in skincare? You won’t find this acid within a plant and let me emphasise the word ACID. 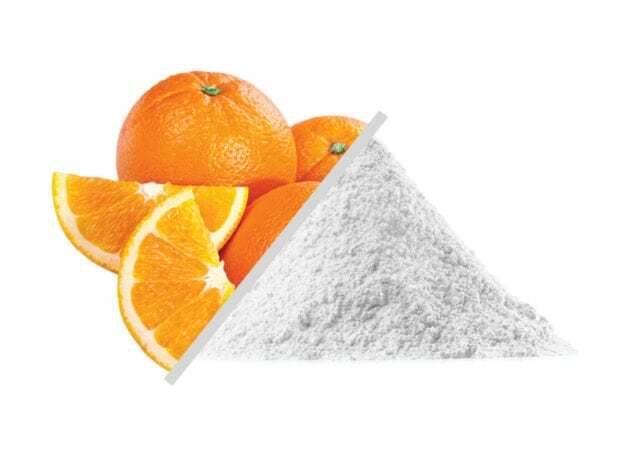 In nature, ascorbic acid is produced when vitamin C is exposed to air or water where oxygen molecules (free radicals) attach themselves to the vitamin C which in turn deactivates the vitamin C.
In other words, its active power has been used up. Thus drying or powdering a fruit that contains Vitamin C will deactivate it along with any other any other processes such as juicing that expose it to air or water as vitamin C will break down within 10 to 15 seconds after exposure due to it being one of the best antioxidants available. Natural carbohydrate vitamin C has a pH of 6 to pH neutral while ascorbic acid has a pH of 1 to 2.5. The pH of ascorbic acid is extremely dangerous especially applied topically and is likely to cause skin irritation and reddening and chemical burns. Mineral ascorbates are ascorbic acid which has been altered to have a mineral salt attached to it. You may find on the ingredient list of your favourite cosmetic or nutraceutical products ‘mineral ascorbates’ while on the front it advertises the addition of vitamin C.
None of these resemble vitamin C.
The only reason I can find why these are synthetically produced is to counteract the very low pH of ascorbic acid as these ascorbates have a pH range of 7-8 meaning they are slightly alkaline. Mineral ascorbates are powders manufactured by reacting synthetic ascorbic acid with mineral carbonates in an aqueous solution. Carbon dioxide is given off and vented then, drying of the reaction occur. The product is then milled to the desired particle size. Mineral ascorbates cannot be compared to the activity of vitamin C as they are structurally completely different. I find it difficult to understand how brands use these types of chemicals and claim they contain vitamin C, but I welcome feedback from anyone who can offer the answer? This is the latest version of vitamin C to hit the market. As you are all aware, vitamin C is a plant produced water-soluble vitamin. Ascorbyl palmitate is marketed as the first oil-soluble vitamin C.
Basically, humans have now turned synthetic ascorbic acid into synthetic oil. I’m guessing, so we can say an oil-soluble product can contain vitamin C and the only reason this would make sense is for the M-word… Marketing. I thought it would be good to share with you how this abomination is created. The esterification of ascorbic acid and palmitic acid is carried out with ascorbic acid and palmitic acid (palm oil derived) in Dimethyl sulfoxide at 75 °C for 18 hours. It definitely doesn’t sound natural to me. Erythorbic acid is an isomer of ascorbic acid. Isomers are compounds that have the same kinds and numbers of atoms, but different molecular arrangements. The difference in molecular arrangement among isomers may result in different chemical properties. Like ascorbic acid, erythorbic acid does not appear to exert vitamin C activity, for example, it did not prevent scurvy in guinea pigs (one of the few animal species other than humans that do not synthesise ascorbic acid). Erythorbic acid is produced in a similar way to ascorbic acid. As you would have read over the past few months, there is massive misinformation in regards to pure vitamin C in skincare. And this is how Biologi works naturally where no other skincare brand has been able to…with active, stable vitamin C that works on the skin just as it does in the plant.